4.2 out of 5 based on 96 bloggers and 15 commenters. 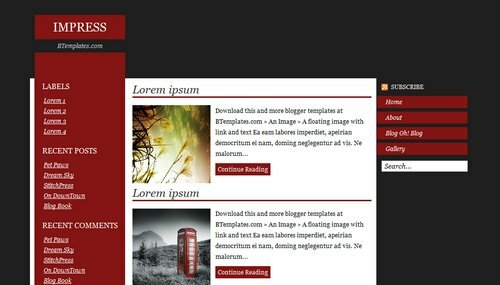 Impress is a free blogger template adapted from WordPress with 3 columns, left and right sidebars and posts thumbnails. ive been looking at the templates here in this site ..
and this is the first time im impressed since some layouts are like the same. the format and stuff. but urs is totally different from others. i love how you did the posts .. theyre like divided or something. there’s like “continue reading” i love that. Hi – I just wondered how i get info onto the ‘extra pages’ that have already been created here in the side bar – About, Blogohblog and gallery etc. I remember seeing somewhere that you do it with writing a post and setting the date to ages ago but not sure where in the html template to add this link, if that is the correct way of doing things. Es primera vez que escribo en un foro. He estado buscando una plantilla que llene mis expectativas desde hace tiempo. Al fin la encontré. Esta plantilla es “casi” perfecta desde mi punto de vista (al menos para lo que quiero trabajar) y digo “casi” por que no puedo modificar donde dice “continue reading”. Por favor, les agradeceria que me ayudaran. Gracias de antemano. Excelente página la de Blog and Web. @José Daniel Figuera: Necesitas ir a Diseño/Edición de HTML, y hacer click en la casilla “Expandir plantillas de artilugios”. Luego, usando el buscador de tu navegador (CTRL+F), debes encontrar el texto que quieres cambiar, vale decir el “Continue Reading” (sin comillas), y modificarlo por un “Leer más” o algo por el estilo. Gracias. Logre cambiarla. Gracias por responderme. Comigo aconteceu a mesma coisa. Parece que o cabeçalho sumiu e o blog sobe todo. Thank you very much. If anyone is interested in an edgy psychology/philosophy blog then come check out my website. You will not be disappointed. ***Not for the faint of heart.